Winter Outlook: Drought Likely To Persist : The Two-Way The National Weather Service's Climate Prediction Center has released its winter outlook. It says chances are good that some parts of the nation hit hard this year by dry and drought-like conditions won't be getting a "normal" amount of precipitation. 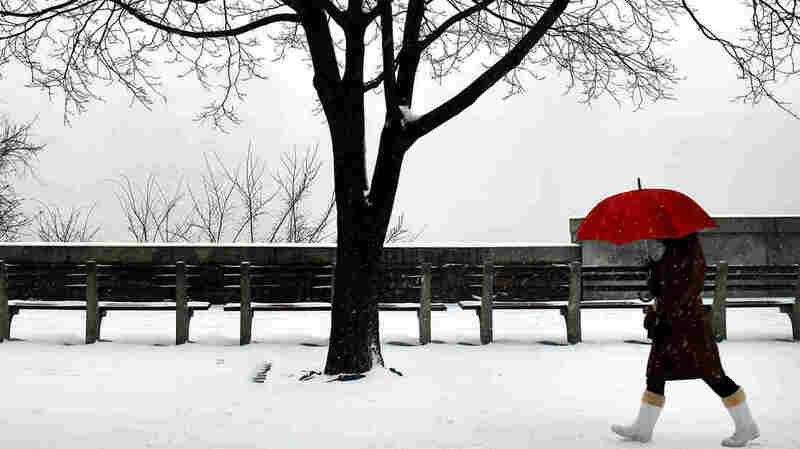 Jan. 21, 2012: A winter scene in Brooklyn, N.Y. Snow may be a relatively rare sight this coming winter in the U.S.
-- There are "enhanced chances for above normal temperatures across most of the western half of the lower 48 states." -- The Florida peninsula is likely to experience "below-normal temperatures." -- Chances are good that precipitation will be "below-median" in the Pacific Northwest, northern California and northern Nevada. Some of those areas have been suffering this year from abnormally dry or drought conditions, as the U.S. Drought Monitor map shows. -- Precipitation is also likely to be "below-median" across "middle and upper portions of the Mississippi Valley and adjacent eastern Plains." Some parts of those states have been hit even harder by drought, according to the Drought Monitor. -- There's a good chance for "above-median" precipitation across "the central and eastern Gulf Coast region." Rain and snow would be good news for areas there that have been parched. -- Other areas seem to have "equal chances of below, near, and above-average temperature and precipitation." In other words, kind of a "normal" winter. "The large majority of that drought we expect to persist," Mike Halpert, deputy director of the National Oceanic and Atmospheric Administration, said earlier today, according to Reuters. "We even see drought expanding westward ... into Montana, Idaho and part of Oregon and Washington."